Is your child struggling with maths in their 11-Plus preparation? How can you help a child to pass their 11 Plus exams when they struggle with maths? How much work your child REALLY needs to do to be in with a chance of passing the 11 Plus? What maths topics do children actually need to know for the 11 Plus? What can you do to support your child when it all seems to be going wrong with their maths? Help! I started preparing my child very late for the 11 Plus. What can I do to buy back some time and get to the standard required to pass the exams? These are just a handful of questions that come through to Geek School from parents who are desperate to get their child ready for these highly competitive exams. Children sitting the 11 Plus are up against thousands of children who are vying for one of the handful of places at their grammar school of choice (usually around 120 places). Private schools see hundreds of applicants for the same number of places, so whatever school your child is hoping to get into, the competition is stiff. Many of these children have been working on 11 Plus maths papers for a number of years and are well on their way to scoring highly on the day of the exam(s). To be successful in the 11 Plus exams, your child needs to pass all papers (English and maths , plus verbal and non-verbal reasoning, if included in their exam) in order to be successful. So failing the 11 Plus maths paper will definitely spell doom. If you’ve tried everything to help your child achieve the coveted 85-90% mark or higher and can’t see any improvement, don’t panic. There are some fundamental steps you’ll need to take to bridge the gap between their current low scores and where they need to reach for a chance of succeeding in the 11 Plus tests. These are all outlined in the ‘Boost Your Child’s 11-Plus Scores by 20%’ guide. 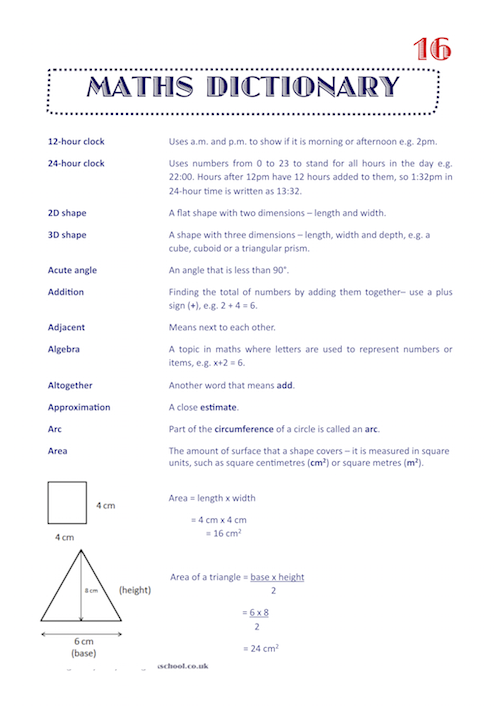 The guide also include a list of maths topics that are covered in the tests, so you can work through them topic by topic, ensuring that your child is well prepared. Did you know that 50% isn’t a pass mark in the 11 Plus? The pass mark for 11 Plus exams is based on the average scores, which then act as a benchmark on which all the children are ranked. So, for the purposes of illustration, if out of 1,000 children, the average mark for the 11 Plus maths paper is 80% and your child scores 70%, the 120 places are offered to children who scored 100% (yes, they do exist! ), then 99% and so on. With so many children sitting these exams, by the aggregator gets to 70%, the chances of there being a place left for your child are slim. When the clock is ticking, you’ll want quick and effective methods to see an immediate improvement in your child’s 11 Plus maths performance. The last thing you’ll want to do is spend hours reading a big manual and trying to navigate through the relevant tips – that’s why this short 24-page guide gets straight to the point. 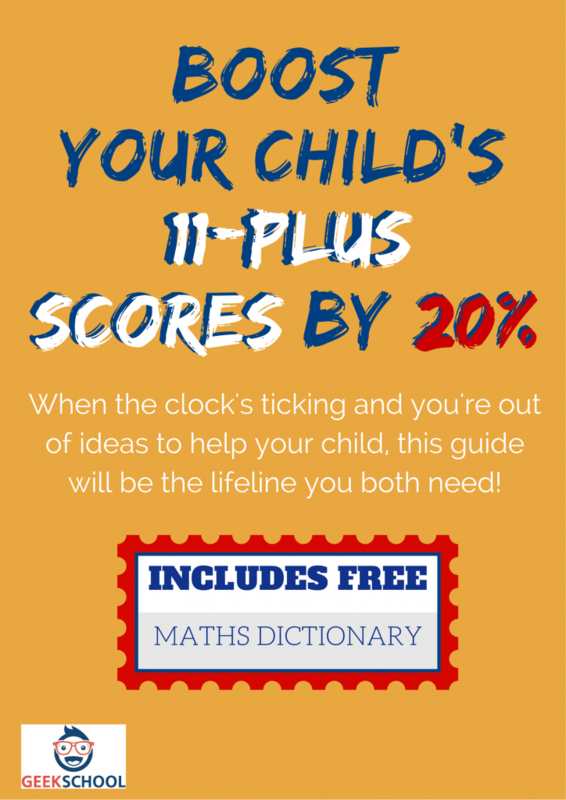 What's inside the 'Boost Your Child's 11-Plus Scores by 20%' guide? The 11-Plus exams can be a daunting prospect for children and parents alike. When other children seem to be flying through their revision and friends and family tell you how excellent their children are or were doing at this point in their child’s preparation, it can set in panic. Big time. If your child is struggling to reach an acceptable mark in their 11 Plus papers and books, it can be demotivating and unsettling. You probably want to know what to do, how and when to get them up to the standard they need to get to – with or without a private 11-Plus tutor. Geek School’s guide, ‘Boost Your Child’s 11-Plus Scores by 20%’ provides just that: information on what to do, how to do it, and other important and helpful advice that will set your child on the right track to success. Written by Joycellyn Akuffo, founder and director of Geek School tutoring Limited, a mother whose first child has already successfully sat and had great success in the 11 Plus (grammar and private schools), this guide will provide the information that only parents who have been through the process – and have succeeded – can pass on. Plus professional, tried and tested methods to boost your child’s maths scores in the 11 Plus. This 24-page guide is short and to the point – time is best spent on the actual doing of the tips and techniques, not reading through hundreds of pages! If you’re serious about your child passing the 11 Plus, don’t even think about tackling the maths component of these exams without reading the ‘Boost Your Child’s 11-Plus Scores by 20%’ guide.